San Ul Lim's early albums have a certain primitive but honest rock sound, in essence like a kind of garage psych but with some refinement in recording. We hear simple chords but with best effect and most effective arrangements. This album also has folk ballads, like track 4, 5. For Korea this more simple straight forwardness of the group with great effect was new. For the Western listener who grew in apreciating creativity with simplicity (with 2/3 chords) it was a recognition of talent. 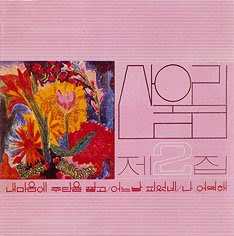 Without knowing San Ul Lim here created a new approach to rock for Korea. (Otherwise Magma would never had sounded like they were)....San Ul Lim 2 might be the best and most adventurous of the lot -- full of spacey, more experimental passages! If San Ul Lim 1 was the most sunshine rock oriented set, and San Ul Lim 3 flirted with hard rock, album 2 splits the difference with a little bit of groovy prog elements and lots of spacey organ! The tunes have some more languorous, moody bits that are rich with atmosphere and some really sweet work on bass, fuzzy guitars and the swirling organ -- but the group's excellent ear for melody and a catchy groove are still very much intact! 10 tracks in all.